The ASEAN Meeting in Vientiane has not attracted, as far I can tell, comment from the usual suspects around the blogsphere. The insistence by ASEAN of a non-aggression pact, to which countries such as China, Russia and Japan have agreed seems on the surface benign. The Howard Government is refusing to sign, which incidentally puts New Zealand in a difficult position. NZ, it appears is keen to become part of the trading group. And it seems, that now, post Mahathir, and the visit earlier this year by the Chinese President, that ASEAN is keen to have Australia and New Zealand as participants. There appears to be good reasons to be cautious. Signing up to the nonaggression pact is code for non-interference in the affairs of other nations, even when human rights issues are involved. Still, the craft of diplomacy applies, and there might be ways around that, I suppose. A real sticking point, it seems, is Howard’s absurd election stunt of doctrine of pre-empltive strike. Diplomacy, politics and trade. Get on the case out there. What more could you want? The answer is probably quite a lot, nonetheless just as this panel of experts determine England is the best side in the world, and France is second, the results from last night come along, which suggest that they are among the best, but it is somewhat problematic to say England is the best, and on recent results more so to suggest that Les Blues should occupy the second spot. Australia won. Not by much, it is true. And equally England did play well, scoring more tries. Even, if England have the potential to be the best, they still have to deliver, and that means kicking penalties. Australia won 21-18. Meanwhile the French are the French. They lost last week to Argentina, and yesterday to the All Blacks by 45-6. There is a lopsided scoreline. The French crowd cheered the New Zealanders, even staying mostly quite during the haka, and booed their own side is the biggest score ever achieved by the All Blacks. The Springboks had a walk in the park over Scotland. As the Italians did over the USA. Only when England have an unbroken chain of victories over the major sides, including others such as Wales and Argentina, will I acknowledge them as best in the world. Bottom line: it is about performance not potential. Some young offenders in the UK, according to the Observer, are to be placed on a diet supplemented with fatty acid, trace elements and vitamins. There are studies from the US showing a relationship between junk food and implusive behavior, and a study from Mauritious that essentials elements in the diet are predictors of behavior. There are said to be some ethical issues, possibilly relating to the issue of free commitment to the trial. Still it is a relatively benigh intervention, and may lead to important results. I suspect that diet may be just one component among many in the generation of anti-social behavior. Will the Falluja campaign have any long term significance in the conduct of the invasion and occupation of Iraq, or will it be just another episode of unaccountable American political and military criminality? The installed, quisling government has come up with a derisible assessment of the numbers of people killed, whom we might be lead to believe were are criminals who took delight in beheading people. The International Red Cross/Crescent, now able to enter the city and attend to people, will in due course make its own assessment. More than 2,085 people were killed and 1,600 detained in the massive US-Iraqi offensive on the rebel city of Fallujah, Iraqi national security adviser Qassem Daoud has said.The US military had previously said at least 1,200 rebels had been killed.The US and aid organisations have only just started discussing the means of retrieving the bodies that are still believed to be strewn across the deserted former rebel bastion. Meanwhile, the Iraqi Red Crescent Society was able for the first time to deliver aid directly to families stranded by fighting in Fallujah after a US-led offensive to wrest the Sunni Muslim city from insurgents.A single Red Crescent team delivered food and water to five families in a battered northern Fallujah neighbourhood after US marines patrolling the area found them hiding in their homes.The Red Crescent estimates that only 150 to 175 families remained in Fallujah after the US-led offensive started on November 8 and civilians living in the ruined city have become desperate for water and blankets.Red Crescent officials met with US marine Lieutenant Colonel Gary Montgomery to discuss cooperative aid efforts. America, now stands as a tough guy, indifferent to the suffering of others, and indifferent to its own health by engaging in behavior that defies stupidity. Melanie Klein describes the iconic imagery that resonates with the newly formed American character. Klein also describes how the Bush Administration notion of impunity, contrary to the founding principles of the United States, acquired confirmation through the electoral campaign from failure of Kerry to oppose the Iraq adventure. Wedge politics has been a great success, at least on the domestic front. Yet none of this would work if the mass media operated as an independent voice of inquiry and open debate, and given this failure, there are questions to be raised about American democracy, our own, and one wonders what kind of democracy will be created for Iraq. Sad to reflect that America is, or was once part of both the legacy and enduring commitment of Western Civilization. Yesterday, I noticed this phrase in reports of the NYT and our own 8 cents a day, ABC News. It seems this is also the preferred description of the the Assyrian International News Agency. Notably, this phrasing was absence from The Washington Post and Reuters report republished in the SMH today. The US continued its new offensive, against guerrillas in Babil province south of Baghdad. It has been a center of the Sunni Arab guerrilla war. It had earlier been a Shiite area, but many Sunni Arabs were settled there by Saddam and given expropriated land. A Basra group of activist Shiites had recruited volunteers to go up there and protect Shiites from Sunni attacks. The CNN anchor in the US during the daytime on Wednesday said that the US troops were fighting “thugs and terrorists” in the “triangle of death”. This sort of language is really inexcusable in a news organization. There are of course thugs and terrorists among those fighting US troops, but a lot of the guerrillas are just Sunni Arab nationalists who reject the US presence and fear that they will lose everything if the Shiites take back their land and homes. I don’t know at what point US electronic journalism became a propaganda arm of the White House and the Pentagon, but it is not a healthy development. And, of course, CNN is hardly the worst offender in this regard! The susceptibility of these organizations to propaganda plants, to frame the telling of their news stories by their organizations does them no credit. Whatever happened to journalistic curiosity and even scepticism? The triumph of American arms and technology against a lesser armed foe has been cast by the propaganda department as a considerable victory. If this were not Duckpond, I could point to parallels in Nineteen Eighty Four, but that is out of place here. At least one writer, published by Al Jazeera, believes that the victory was pyrrhic, and the fighters, insurgents, or common criminals, or whoever they might simultaneously be, have gained a moral victory equivalent of the stand at the Alamo. I read reports today of gruesome slaughter houses, where hostages had been beheaded, but curiously did not see pictures. Anthopology, much like cosmology, is replete with hypothesis. It seems that to cross the landbridge to North America, the emigrants had to have a needle and thread technology. It is interesting to observe that boring the hole was more difficult that threading the needle. And Neantherthal was not particularly adapt as either of these arts, as members of the family homo sapien sapien, confiring a significant evolutionary advantage, that in turn were related to telescopic vision, fine hands and idle tonques to spread information, as human beings are still want to do. A fuller story is contained in The SMH, republished from The Baltimore Sun. I have not the links. 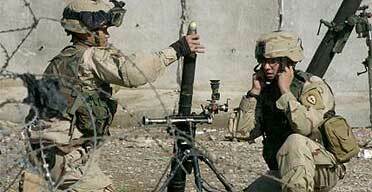 The Wild West is alive and well, and its spirit animates the officer corp of the US Military. OK this report is from Al Jazeera, and I am not sure where or how they acquire their information, presumably from the Iraq troops accompanying the US forces.One officer, before invading Falluja, is reported as saying “shoot on sight”, and others said “shoot anyone 15 to 50, even if they are not carrying a weapon.” Another report of a officer briefing is: “We are killers, not murders. Do not cross that line.” And so forth.The examples are reported here. Of course, to be an American is to be immune from the riqour of international law. They kill who they like, when they like. It is nothing to be proud of, and it is repugnant to be associated with. Still; it seems, since the military glory of Falluja, the intensity of the insurgent campaign has picked up. David Tiley is keeping up to speed on Iraq post Falluja, unlike, for example, The SMH. He links to this report in The Independent, which seems to indicate that not all marines are one mind. Some can think, and try to do what they can. It is a pity that such quality of mind is not displayed President or by those advising him in the White House and elsewhere. Posted by wmmbb in Duckspeak, Iraq Policy. I would suspect that these weapons are relatively not accurately targeted, and hence increase the danger of non-combatant deaths. The Americans may have descended into the depths of no rules – it is what you can get away with, and you can get away with murder. The rogue superpower that murders innocent women and children to feed it own delusions. No rules, no boundaries, pure and unabated criminality. Meanwhile, two Iraqis died as Iraqi forces and US troops tried to storm a Sunni Muslim mosque in Baghdad after Friday prayers, Reuters reported. US armour had surrounded the mosque and the raiding force opened fire when hundreds of furious worshippers tried to beat them back by pelting them with their shoes, Reuters said. Meanwhile, the top US marine commander in Iraq said the US-led assault on Falluja has “broken the back of the insurgency” in Iraq by taking away its safe haven, scattering operatives and disrupting their command networks. Lieutenant-General John Sattler said on Thursday the town was secure but not safe, with heavy fighting still erupting in some quarters of the city as marines and Iraqi government troops cleared buildings of holdouts. Now the elections are over in Australia and the United States, is it not satisfying to know that the Iraq Invasion and “the War of Terror” is going so well. * The “war of terror” is a coinage of a SMH letter writer. The New York Times carries a detailed account of the mosque happenings. From The Independent, here is a journalists account, as a person trapped in Falluja, who stayed behind to protest his house. An opposing view is represented by The Weekend Australian concerning the behavior of US Military in Falluja. America’s enemies have seized on video footage of a US marine killing a wounded insurgent during the fighting in the Iraqi city of Fallujah as evidence of the corruption of the US cause. I do not find it convincing and based on assertion. The withholding of information is critical. Americans, generally, have not been brought to account for their transgressions. Meanwhile the ICRC condemn the “utter contempt” for humanity shown by all sides in the fighting in Falluja. I repeat what I have said before any movement to oppose terrorism, regardless of its perpetrators, is a moral cause. Yep there is a good chance that is so, Edward Wong. The question: Why cannot The NYT say so? 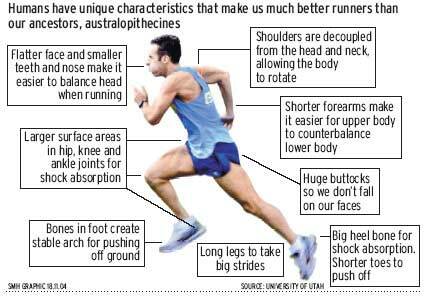 The human body is designed to run over long distances. After thirteen years of research, two Anthopologists have publiched their finding in Nature, which in turn were reported by The SMH and The NYT. Watching pigs run on a treadmill, it was noted that they could not hold their heads still, which humans can because of telltale signs, evidence of muscle connections, on the skull. Earlier hominids such as Australolpithecus do not have same muscular connection points to the skull. As a running animal, humans are unique among primates, and share prolonged running ability with horses, dogs and hyenas. Apparently, we are able to run down dogs and often keep up with horses over the longer haul. You run with your friends. Dogs and horses have proved very useful to human beings, as human beings have proved to be very useful, at least, to dogs. And it sounds very convincing to me, but as always there are those raise doubts about how this evolution took place. Human scoeity seems to be characteristied by the specialization of activities. Evolution is a paradox, a collective and species producing paradigm, yet simultantaneously through time creating higher degrees of individuality. The graphic is from The Sydney Morning Herald.